Shonen Knife is just too adorable and sweet of a band to really capture the true grit of the Ramones. Japanese girl group pop favourites Shonen Knife – who have been around now for 30 years – were, in the early 1990s, the darlings of the alternative rock scene, as they had fans in bands as Nirvana, Redd Kross and Sonic Youth. Things worked the other way, too, as Shonen Knife themselves were enamoured with American pop music, being particularly fond of not only the smooth soft rock style of the Carpenters but also the ever so more abrasive sound of the NYC punk scene courtesy of the Ramones. Not only does Shonen Knife, whose repertoire boasts songs about cookies, sushi, banana chips, jelly beans and mutant jellyfish, have a tune called “Ramones Forever”, but the band has a side project called Osaka Ramones -- the band is from Osaka, Japan -- that plays nothing but Ramones cover songs live. 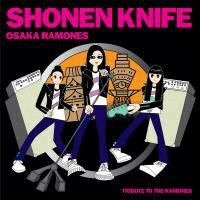 To celebrate their 30th anniversary, which seems to be a bit of an odd thing to be overjoyed by when you consider that vocalist Naoko Yamano is the sole originating member of the band, Shonen Knife has decide to put together and release a tribute compilation album existing entirely of Ramones standards. What you get with Osaka Ramones – Tribute to the Ramones is a note-perfect reinterpretation of Ramones songs without a shred of irony. And therein lies the rub. While the Ramones themselves were brash, anti-authoritarian, and unafraid to play shows with either their middle fingers in the air or even up their nose, Shonen Knife on the other hand embodies the main stereotypes of Japanese culture: they’re nice, polite and cute as a button. Obviously, when the latter comes to perform the songs of the former, something’s bound to get lost in translation. Part of the problem with Osaka Ramones lies in the smooth, varnished and unexciting production, which was partially manned by Robby Takac of the Goo Goo Dolls. Yes, you’re reading that right. The Goo Goo Dolls. I don’t know about you, but when it comes to capturing the raw, frenetic feel of the Ramones in the studio, the last person you would want in the control room is someone who was responsible for such balladry as “Name”. The combination of Shonen Knife and the Goo Goo Dolls just feels as wrongheaded as the Ramones’ attempt to breach the upper echelons of the pop charts by bringing in Phil Spector to produce End of the Century. It’s a mismatch of the highest order, and it shows. Compare Shonen Knife’s rote perfect, canned interpretation of “Sheena Is a Punk Rocker” with the poppy, in-your-face live cover by Hüsker Dü on their album The Living End. The latter practically drips energy and enthusiasm, while the Shonen Knife version is a limp, by the numbers reading that sits like a lead balloon in the studio. It’s a pervasive feeling throughout the album: in a way, the members of Shonen Knife sound a little bit bored in their absolutely flawless takes on such classics as “Blitzkrieg Bop”, “Beat on the Brat”, and “Chinese Rock”. Granted, there are hints that the band is having some fun in the studio by fading out a couple of tracks on gibberish and clapping, but it seems forced. And when Yamono sings “gonna kill someone” and “I’m a teenaged dope fiend” on “Psychotherapy”, it has about as much threat and menace as someone sucking on a lollipop. It just doesn’t work. Therein points to another issue with this tribute compilation: the song selection themselves. Some things just don’t cross oceans or gender boundaries very well, and some of the tracks that Shonen Knife tackle aren’t very well suited to the band. Particularly, the group decided to take on a version of “The KKK Took My Baby Away” – a song that was suitably tongue-in-cheek in its original incarnation, but just sounds very weird coming from the mouth of a middle-aged Oriental woman. I just can’t wrap my head around it: the justification behind why Shonen Knife thought it was appropriate to take on a song, as whimsical as it might be on the surface, that references white supremacy. I’m kind of at a loss, particularly since this version lacks any sort of sarcasm whatsoever. Plus, to go a few steps further, “Chinese Rock” is about heroin addiction. I don’t think the members of Shonen Knife, just based on their discography at least, have gotten a million miles close to a gram of anything illicit, which makes their cover seem dishonest and inauthentic somehow. What’s more, the band has decided to keep the masculine pronouns of such Ramones chestnuts intact, so we get a straight-up rendering of tracks like “She’s the One” with lyrics like “No, never find a girl like you”. Now, I know that the Ramones themselves covered girl group songs like “Baby, I Love You” (originally performed by the Ronettes), but the thing about that song in particular is that the “baby” can refer to either a male or female. There’s no gender preference in the song – which makes it one that a man or woman can cover adequately. However, “She’s the One” is rooted in sheer masculinity, and while I don’t want to get into the thorny world of gender politics – and I don’t know what the sexual orientations of the members of Shonen Knife are – the cover just doesn’t sound very convincing. It just doesn’t seem right for a woman to be pining over another woman unless the singer has openly come out of the closet, and is skewering the male-dominated gaze of the song’s overtures. Put it another way, if I strapped on a guitar and went to a club and covered “Tattooed Love Boys” by the Pretenders and really meant it in my performance as a white heterosexual male, I’m sure the audience reaction would be more than a few nervous titters. I just think that if you’re going to be reverent and do songs as close to the original versions as possible, you have to consider the source material and whether it’s appropriate or not. There are songs in the world-wide canon of music that men and women can both do justice to, but there should be songs that are just for men only and vice-versa. I would argue that “She’s the One” is one of those songs. Osaka Ramones is interesting in one respect, in that Yamano sounds a little like Debbie Harry in her readings of some of these songs. But were the Ramones meant to sound like Blondie? You might want to debate amongst yourselves on that one, but, on the whole, the exercise seems a little like an act of futility. Shonen Knife is just too adorable and sweet of a band to really capture the true grit of the Ramones. However, this album isn’t entirely terrible. The band’s take on the lesser-known “Scattergun” is convincingly rocking in a cod-rock sort of way, which leads me to conclude that Shonen Knife might have been better off veering away from some of the Ramones’ most famous material and had stuck to choices that wore better on the band a whole lot better. Maybe an EP’s worth of material might have been more up their alley, instead of the 13 tracks covered here. As well, even when you’re doing versions that are so close to the originals, it’s hard to really screw up the three-chord punk that the Ramones pioneered, so, if you’re looking for karaoke versions of the Ramones, Osaka Ramones does an adequate job at capturing some of the carefree nature of the songs – languid production and all. However, insofar as true “tributes” go, Osaka Ramones just seems deceitful and, to borrow a line from a well-known Ramones song, somewhat “sedated”. As a listener, if you want to experience an authentic portrait of the Ramones, you’d be better off going out and buying an actual Ramones album. As it stands, Osaka Ramones is a misguided affair almost from start to finish, and, as a whole, should be given as wide a berth as possible except by completists who have to have absolutely everything by Shonen Knife – proving that maybe the band should just stick to their classic material of songs about cookies and jellyfish from here on in.